Description: We have found this featured mechanical roller lifter to be one of the best in design and mechanical reliability for the Olds engine. Used in our own applications, these Crane .842 mechanical roller lifters feature a thicker body and a superior wheel for dependability even with the highest of rpm engines. Description: Roller Lifters, Mechanical We have found this Crane featured mechanical roller lifter to be one of the best in design and mechanical reliability for the Olds engine. Used in our own applications, these Crane .842 mechanical roller lifters feature a thicker body and a superior wheel for dependability even with the highest of rpm engines. Description: We feel it is simply the best Oldsmobile roller rocker on the market. Talk about bang for the buck, these Harlan Sharp rockers can be used to convert any stock valve train into a fully adjustable rollerized one. No more messing around with factory stands and shims. Roller rockers increase the mechanical life expectancy of your valve train and will add additional hp and torque to engine. We use them in all of our engine builds and wouldn't consider anything else! Harlan Sharp roller rocker sets some equiped with poly locks and adjuster nuts. Available in 1.6 or 1.7 ratios. 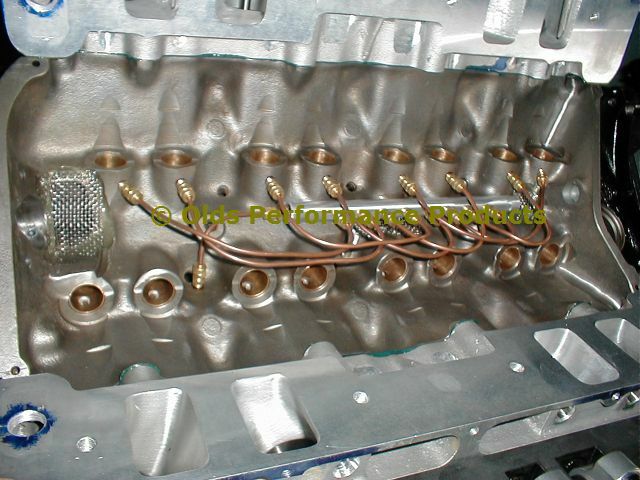 Description: This alternative method of lifter oiling is used in many of our own roller camshaft applications and allows the engine to provide additional oiling of the main and rod bearings without starving the valve train. This kit includes 19 specialty fittings, tubing, manifold log and easy to install instructions. Description: Manufactured from 6061 T6 651 aluminum and blue anodized. The bracket includes 4 stainless stand offs and stainless hardware. The standard stands are 2.25 long. These stand offs are available in .250 increments, from starting from 1.50 to 2.25. Weight with 2.25 stand offs and hardware is 0.61 lbs. Description: Manufactured from 6061 T6 651 aluminum and gold anodized. Mountain Motor Pump bracket only. Stainless steel hardware to attach bracket to pump is included.